This app allows users to discover schools from the Find page in multiple different ways! Users can discover schools this way whether or not they have created an account. A user can create an account using the Sign Intab, where they can enter their name, email, and a password to be able to create a new account. Once an account has been made, the user can sign in or out using this login information whenever they want. Once logged in, a user has the ability to add and remove a college to their favorites list directly from viewing that college's card and clicking on the Favorite or Delete button on the bottom of the card. 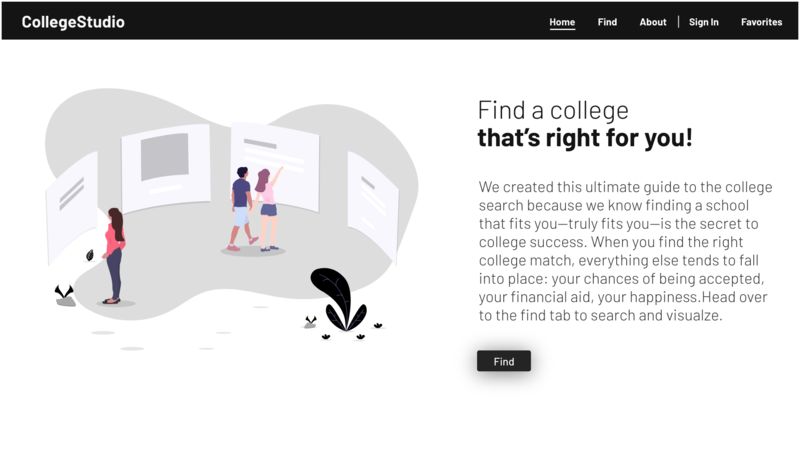 Additionally, upon logging out and back in, user's preferred tuition value is saved in the search sidebar on the Find page.